February 25th 2014 marks the day my 2nd full ambient/electronic music album was released. Thanks to Apptronica . I had intended to have this prepared in time for the release. Unfortunately I didn’t prepare well for just how many uncomfortable memories it would dig up. Coping with the memories over a longer period of time during the production, one at a time, was a little challenging but to confront them all at once proved to be more. I have written this “Album Description” several different ways in recent weeks. Each time I ended up deleting what I wrote. I’m honestly not sure why? Maybe it was too personal, too painful, too long? I don’t know. I wanted to be completely honest, sharing every detail. Too many details I guess. Then I felt finally that I could still share details honestly but without putting too much of myself in full view. So by personal right I choose to convey the honest meanings without extremely personal details. Those are mine, and I lack the skill to properly place every single piece in the light avoiding where it could not be misunderstood. So you still get the descriptions but not necessarily every single detail. Besides, it would end up prohibitively lengthy. To start off I’ll repeat the general concept that is “Chapters”. This album is a collection of songs that each have a special meaning to me. They were created based on memories of people I’ve known, the times and places I’ve known them, and how they affected my personal growth. Each track is placed in chronological order. Some spanning years. Some overlap. An “Audio-Biography” of sorts. Far from being a full and complete biography as it begins at age 13. When I was a child of 13 years, on April Fools day I experienced the most traumatic event of my life. I was accused of something I did not do, something terrible. I was punished in ways that would drive most to suicide or worse. “Cook” is the name of the person who invented the false accusation. All for reasons I’ve never known or understood. It was a horrifying event for me. It did in many ways lead to how I see and trust people throughout my entire life. It is why I will guard my word with ferocity. To this day I have zero tolerance for false accusations, or distorting the good truth for some feeble minded twit’s personal gain or desire for attention. It is why when I give my word to a truth I state, it is nothing more or less than the truth. I am only as good as my word. I never received justice for the lie Cook told. Only a very harsh lesson on the cruelty of some. I was 21 and on a road trip with my then-best friend Dean. It was a whirlwind tour of some of the most amazing natural wonders found in Arizona and Utah. My first real road trip ever. We drove around listening to music from one cassette tape to another picked from plastic bags full of tapes. My friend and I were having a grand time exploring canyon rims, unusual rock formations, arches, monuments and local towns. It was all very memorable, but one day in particular was special. We found ourselves at the visitor center for Canyon De Chelly. That visitor center was where we first learned how to pronounce the canyon name. “Canyon Da Shay” would be the way. Not Dee Chellee, or Shelly. We laughed. We visited a spot called “Spider Rock” a huge towering stone column hundreds of feet high but at eye level from our vantage point. Dean burned incense and we smoked some… Um… Natural botanical. Listening to some music I’d never before heard at the time by Bernd Kistenmacher. I think that’s how to spell his name? It was perfect. Dean was constantly roaming around and demanding I share his experience the same way. He wouldn’t leave me be until after I said, “This experience is mine and not subject to your approval or satisfaction. You enjoy yours where you are, and I’ll enjoy mine where I am”. Or something like that. It pretty much summed up our friendship. Me always trying to follow along with whatever he said, and he always passing judgement on me for things he utterly failed to understand. I loved my friend, I learned a great many things thanks to him, but one day not long ago he just abandoned me. There were one too many of his absences, and failures to follow through on promises for me to tolerate anyway. I don’t hate him. I miss him in fact. But he only lives for himself leaving nothing but broken promises in his wake as he passes irrational arrogant judgements on others he has no right or real understanding of. Nevertheless, I hope he lives well and long. Not her real name. She was Hilda. She was unimaginably beautiful like something from a dream. My first great love. My first wife. My first loss. We met at a bowling alley shortly after my 18th birthday and were together from that day until shortly after and to the very same day exactly 9 years later. We were young and in love. Later proving me more than her. We ran away together. We lived and shared things only she and I will ever understand. Then one day she ran away from me. My own fault. I was young and stupid taking her for granted. It was inevitable. She refuses friendship today no matter how I try. Something I don’t understand. I’ve only heard through others how she is today and the things she thinks of me. Many incorrect. Oddly the most bothersome thing she thinks is that I like Rush Limbaugh. Absurd. I’ve never “liked” him or anything he stood for. Dislike intensely is more accurate. I did say to her once that I thought he was “funny”. Far from a liking notion. Anyway, she’s always had a penchant for deleting people from her life without hesitation. A form if cruelty maybe? Or a form of mercy perhaps? I’ll never know. This track more than anything is about a time and collection of people. It’s the time after “Cecelia Ran Away” where I was utterly lost and hopelessly alone. I lived off of misery, beer, and fast food. I had no will to live, and less courage to die. I nearly did die on purpose several times. I had some fun too. I met a pretty blonde girl with a figure putting swimsuit models to shame in the earliest months of this despairing time. Carey was her name. She dumped me of course, but it was the single thing that gave me a tiny shred of hope. The hope I might one day come out of the hole I dug and find happiness. It wouldn’t be with her, and probably for the best. Through all those months of drink, self pity, self loathing and death wishing, having met her was the only evidence I had that I might not forever be alone. She did save my life, and she has no idea. The title track marking the beginning of hope. This is the chapter for my wife Tina. After a couple years of heavy drinking and drug abuse I met her. My pretty green eyed lady. Her powers of seduction were very quickly understood from the start. If only I could share that. Let’s just say when we were dating her strategically placed bed sheet in some mornings were responsible for numerous late arrivals to work. We married quick by eloping to Reno. It was bumpy as all hell at first. Very very bumpy. I was nearly thrown a few times. Together we have experienced trials and tribulations not uncommon, but still uniquely ours. The good and the bad has brought and kept us together 14 years and counting. I’ve seen her change a radiator while 8 months pregnant. That’s my kind of gal. We aren’t rich, but we care for each other and complement each other. I do love my wife. Truly to death do us part. It would seem that so far this has all centered somehow on a woman and or tragedy. This next track is again about a woman, but much different. This is for Grace. Tina’s child from before we met, but my daughter. Grace was 5 when I met her. She might be why Tina kept me around? I say that in jest, but also because she told her mother once “I like him because he is crazy”. Too true. Grace is 19 now and in college. I wasn’t always there for her, and that damaged our relationship. It doesn’t make me love her any less. She is right for the most part, and where it matters. I should’ve done better. I’m sure she will. Her voice is what you hear speaking in French on this track. Its about the choices I’ve made and the many ways to color them. We can focus on the good, or live in the past. It all depends on your favorite color when painting your memories. No this isn’t a spelling error. This is for our son Jacob. Much has and does revolve around him. When he was still in his mother, I would make up silly songs to sing to him from the world outside. I can still feel his strong kicks on my hand. I called him shaky Jakey because he was so restless in there. I was the first to hold him when taken from the womb. A perfect baby that slept through the night. A gleam in his little eyes all the time. He grew and grew from adorable toddler to the big boy he is today. Still growing I might add. A funny, silly and smart boy of age 10 now, he remains the center of my existence. My funny son. 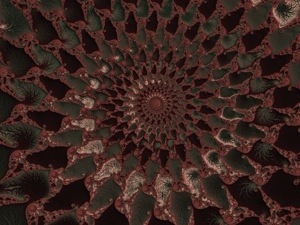 Here is another that is more about a collective experience. This marks the time when I began to find my way into music. Not just hearing, but making. This was one of the first tracks I ever made on my old iPod Touch. I was at a local park with my then 5 year old son Jacob. Oh what gorgeous day it was. Jacob can be heard playing some large wooden percussion instruments in the background. It may sound like a glitch, but there is a ball being lazily bounced on the concrete that begins close by, and moves further away. I recorded that and the laughter of the children having a grand day at the park. Of all things it was the day at park that made it memorable. It reminded me to cherish moments and not take them for granted. It also was when I discovered the joy of making music anywhere. The title may sound less than encouraging, but it does mean something positive. For a long time “normal” for me was popping pills and drinking. I would easily swallow 15 vicodins during any given day. I popped pain pills like they were M&Ms. I shouldn’t be alive. I didn’t want to eat so many pills so often. It is my chronic pains that led to the addiction. It was my lack of strength that kept me on them. On March 18 2010 I had enough. I decided I needed my liver and kidneys. I quit everything. Well except cigarettes. Lungs be damned I guess. I went and got treatment for my addiction and since that day I’ve not once cheated or broken the continuous string of days, months and years completely sober. No drugs or drink. No pot even. Not even a single beer or glass of wine despite a stupid, careless, and entirely imagined rumor by some tiny man bent on harming my name. I am completely sober and committed to remaining so. Remember, my word is absolute. Today I’m pretty boring, compared to some friends memories of me. Just routine medications I need are all I ingest. What was once normal is no longer and I’m better for it. A ghostly title. It’s not about ghosts though. Not really. This is about you. All the people I’ve met, but not really met. Don’t get me wrong, I appreciate everyone I meet no matter how. The point is this is about all the amazing people I’ve met online via Twitter, Facebook and the likes. Most I’ve never seen face to face as though they are phantoms in some far off place. All of the same growing hive. Not hive minded, but in spirit sharing the same passions. This is for all the people who supported, encouraged and became friends. Not just with me, but with each other. All very real and except for maybe a couple rotten apples, all very good. Today. This ends the album with some music inspired by a lifetime of memories. The good, the bad, the beautiful, the ugly, the joy, the sadness and everything in every combination. All for today and all days we are fortunate enough to see come. Less about memory or even a person, this is for the future. Every step forward comes with every sunrise. We don’t know what tomorrow will be, or where we will be. I do know that speaking at least for myself, I’m looking forward to it. To conclude this album description I will offer some brief insight about what and how I made this album. 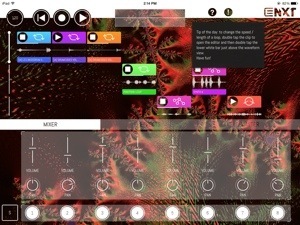 All the music was made using only iPads (3,4, and the last track on my Air)and iOS. Music apps. Most work was done in Auria and Cubasis. All were touched by AudioMastering App. I used Audiobus a lot to bridge the apps. I also used Inter-App Audio a lot in the more recent ones. I worked on each only while having the relative memories they were based on in mind. This album would’ve been finished about 6-8 months ago were it not for a tragic data loss disaster. That disaster led to the destruction of 7 tracks I had been working on for this album. Talk about having a do over. I used so many different apps. I made so many sounds from scratch. I tried to make it a point to not reuse any one sound outside the one track is was designed for. The iOS music apps I used to make Chapters and in no particular order will follow. This doesn’t include the already mentioned apps above. Additional things I used at some point. All fits into one bag and can be used anywhere I go. I hope this was worth your time reading and makes more sense out of my concept album Chapters. Chapters is a collection of songs inspired by the artist’s most vivid memories throughout his life, marked also by a specific person he has known – an “audio-biography” or concept album of sorts. 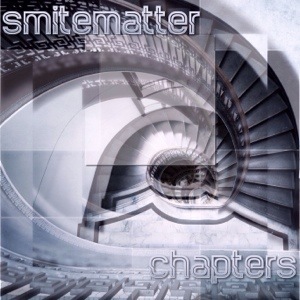 Chapters is the second album by Apptronica artist SmiteMatter, produced entirely using iOS apps and devices. David Israel, known to most as SmiteMatter, started in 2009 with just an iPod Touch and some early music apps and was instantly hooked. For SmiteMatter, the concept of being totally free to autonomously create music anywhere with no need for anything else was extremely habit forming. 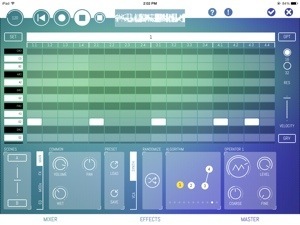 A purist from the very beginning, SmiteMatter now makes his music on a couple of iPads. My wife Christina, with love, for tolerating me with my nose in my iPad every day and night, and having to hear everything over and over and over and over. My son Jacob who is my greatest collaborative effort. My daughter Grace. Still my little girl. I’m sorry I didn’t do better. Clif Johnston for believing in me, and being a good friend. Bruce Gall, who has been so incredibly supportive with so many spins on his shows ARFM SundaySynth and Atmospheres. Christian Augustin who on more than one occasion generously pulled me out of the fire. Neal Murrell AKA Ithaca Benesh. Our short lived friendship meant so much to me, & I miss you. I’m sorry this is so late. I hope you’re listening wherever you are R.I.P. Marius C Hammerich AKA Kikai Kikagu for the great help getting the polish done. You taught me valuable lessons. The iOS Music Community and Artists. So many incredible, talented, and hilarious people who have in their infinite kindness supported me and inspired me in countless ways no matter how tough things got. All proving what can be done, where ever they are. iOS Music Bloggers for supporting my efforts with links, and numerous supportive gestures. iOS Music App Developers for all the codes, early looks, and for your clever innovation and designs inspiring a growing collection of creatives to shine. A follow up post is being drafted with track descriptions and some detail of how they were made. 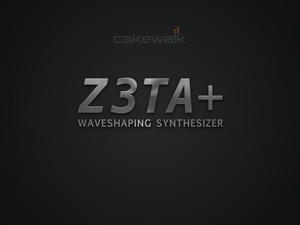 Cakewalks Z3TA (Zay-Ta) Wave-shaping synthesizer is now ready to be yours on your iPad. At 1/5th the price of the PC/Mac version and every bit as powerful in every way, its a steal. 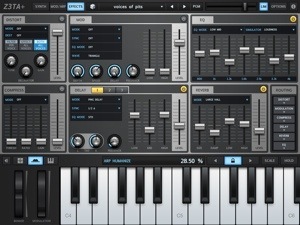 Cakewalk says this iOS version has all the power, features and rich wave shaping goodness as its famous computer version. 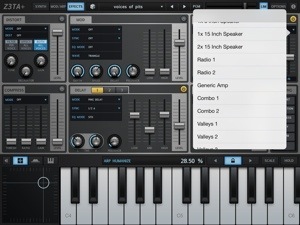 Only significant difference is that the iOS version has fewer presets. Which is no loss for those who want to really see what this sound designing behemoth can do at their own hands. This beauty is something you should put your hands on and never let go. Alrighty then. I think I’ve pretty much used up every clever (and not so clever) euphemisms describing previous iOS synthesizers. Forgive me if I borrow from some of those other reviews here. Z3TA is a god among synth gods. We have seen some amazing entries come our way, but this is ridiculously awesome. The first of 3 pages is the main “Synth” page for your sound sculpting joy. 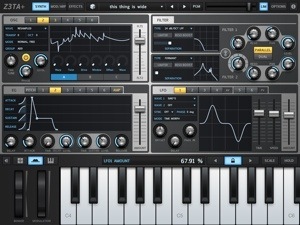 6 wave-shaping oscillators each with dozens of waveforms to choose and assign to them. With these come 3 (A,B,&C) sections of more shaper controls to further twist, mangle and fold each oscillator to mind boggling sound angles. The textures and degrees of options leave me blissfully drooling. OK we have a lot of oscillators, but also a large collection of Envelope Generators (EG). Eight EGs to be exact. 1 bipolar (for pitch), 1 Amp, and 6 unipolar envelope generators for for general purpose. All but the pitch EG are 5 stage envelopes with independent curves. Much of what you can do with these are brought to life with the modulation assignments. I’ll get to that in a bit. I should also point out that there is a single die which would commonly be seen as a randomizer, it’s not. Touching the die will only randomly select a preset patch. It will not randomize any parameters. Also found on this screen are parallel and dual mode filters. Again, dozens of filter types to choose from. 36db Low Pass Filters, resonant boosters, formant, comb and more. No shortage of filtering options and you can adjust panning separately or linked. However the Formant filter is a bit weak and I’m not entirely clear on why its separation slider won’t move? Then we have the LFOs. Six LFOs! Again each with dozens of waveforms to choose from and assign. LFO One thru four affect all voices simultaneously, where LFO 5 and 6 affect individual voices. Are you getting the picture? Power. The second page is the MOD/ARP section. Divided in half this page houses the 16 source modulation matrix and the Arpeggiator. The Mod Matrix should look familiar to eyes used to seeing such things, but if not its still intuitive enough to jump right in. Select the route, curves, controls, destinations etc, all very easily. 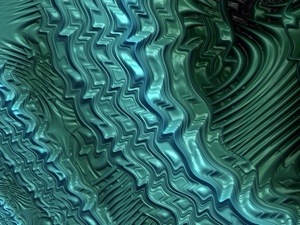 It won’t be long before you find new textures and morphing designs of all sorts. More power. The Arpeggiator operates as a standard algorithm type, or as MIDI mode. The algorithmic mode is strait forward with the usual up, down, octaves etc and nothing particularly challenging. We’ve all seen this. It works, no problem. 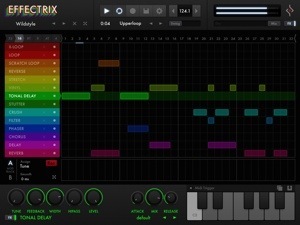 The MIDI mode is a little more interesting as it plays preprogrammed patterns. 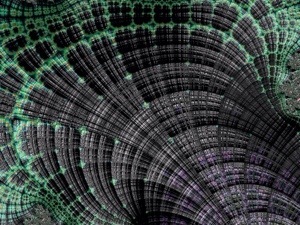 Select from hundreds of creative MIDI patterns. There are some real gems. Additionally there is the swing and humanize dials to modify the groove with. The third and last page is the Effects page. Six advanced modular effects. Varied distortions, 3 Delays with sync, cross, ping/pong, modulations like Stereo Chorus, Flanger, Phaser of different types. A Reverb with big booming sound or subtle room types. A Seven band EQ with several mode types and speaker simulations. All the FX in the chain can be re-ordered to your liking. This is where I usually make note that I can’t list every single available parameter and feature. This is especially true with Z3TA. There are more than I have time to count. So please do visit the Cakewalk site for many more details. Even though I’ve included the more important details, many are left out. 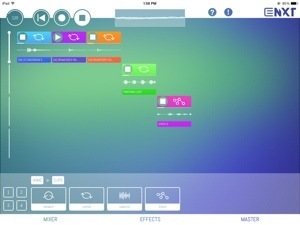 I shouldn’t forget to mention that Audiobus, Inter-App Audio, and MIDI are supported. Also the multi range keyboard with x/y, modulation and bender are included standard. Really who didn’t expect that? This synth is beyond worthy of the obligatory “HUGE” exclamation. It is not just that Cakewalk delivered the very same feature packed version as its PC original. Its in the sound. The feeling of control and satisfaction with what is heard will raise neck hairs. The degree of shaping sound designs is enormous. I can’t take my eyes off this nuclear power plant of synths. I’m not saying its the best synth ever made, but at the moment she does hold my heart firmly. Z3TA (damned threes posing as “E”s) launches with a bang resembling independence day fireworks and celebration. Only small concerns perplex me. Most are design related. I don’t get why there is no On/Off button on the Arpeggiator? Why is it in the settings drop down menu? Really, why? Another really silly design flaw is that with some parameters they only cycle in one direction. Such as selecting an oscillators octave, you have to cycle all the way through, one way with no backing up. 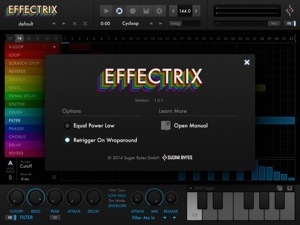 Also there’s no real arpeggio customization such as what’s found in synths like CubeSynth. When using this with IAA hosted by Cubasis, some of the patches I tested crumbled and crackled while trying to record on iPad 4. However bad that sounded, the recording was pristine. It didn’t happen a lot, but it was bad on a couple occasions. I did not have that same experience on my iPad Air. Plus Cakewalk seems to think we don’t want to easily share our custom patches with each other. There is no option to email custom patches or banks. Why? They don’t seriously expect us to plug our iPads into a computer just to dig them out and then share? Not me. No way. That’s all I have to complain about really. It’s relatively cheap and I don’t think anybody complaining about its price can be taken seriously. This is worth every penny if not twice more. Z3TA is sublime. Find a way to get yourself one. I’ll be honest, I didn’t get along very well with the first Electrify app. When I saw that Ingolf Koch released NXT I was a tad skeptical. After talking to some fellow iOS music artists who have experienced both the old Electrify and the brand new NXT, my eyes began to open. I got a little excited for this new and different follow-up. When I finally had NXT in my hands exploring it for the first time, I understood why the folks I spoke to were so happy with it. Electrify NXT is much different, and better. Electrify NXT is more than a sequel, it is a completely new app. Redesigned appearance, workflow, audio engine, and tools to provide a greatly improved product. A product that does its job very well. Loaded up with hundreds of presets, samples, loops and effects, it has a nice FM synthesizer, 8 sampler drum kit, multi track sequencer, automation, sampler, and mixer. All utilizing the intuitive touch interface splendidly. The polyphonic FM (Frequency Modulation) synthesizer has 11 algorithms and wave-morphing oscillators. Full envelope, and LFOs, all with easy multi-effects routing. Creating classic FM type sounds from scratch is a snap. 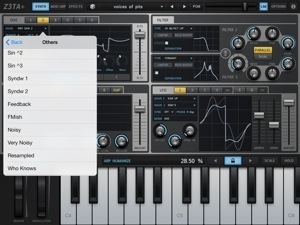 Having this built-in synth is very good for quickly crafting sounds, melodies or sound effects. Use presets or create and save your own. It’s a good, capable synth, but I wouldn’t say it has infinite sound possibilities. At any rate I’m glad it’s included. The drum kits can have 8 samples loaded to the 8 pads. 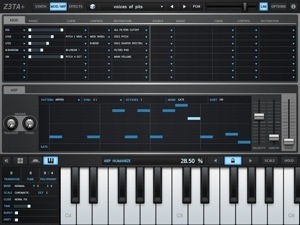 Tap out your own beats using those pads, or just touch the sequencer steps you want them in. The looper/slicer is indeed strong and is excellent for rearranging and redesigning your beats perfectly. Including a clip editor, creating custom loops is fun and simple. Just the way I like it. Beats and sampling made easy. With over 1600 full loops and individual clips covering a wide variety of styles and sounds to choose from there will be no shortage of options for your sequences; or use your own samples of course. Everything can be set to play in perfect sync and on the fly. Load the screen with blocks of samples and quickly activate or deactivate what’s playing and when however you like. No interruptions. As you can see from the above screen shot, customizing the background can be done. Piece of cake, but I’ve experienced some occasional crashes when using my own custom backgrounds. Going back to the default options resolved the crashes. NXT offers a sweet list of several effects to use. 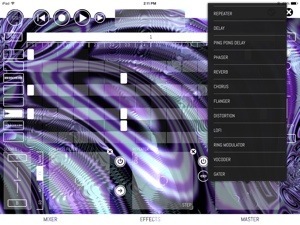 Each effect is well done and can be modulated, tweaked and adjusted. With little x/y pads for each in the chain for some added convenience. Usually offering FX in this quantity ends up with mediocre quality. Arguably the same could be said here with some, however they have a purpose and are functionally sound. I don’t think there’s much reason to complain. The variety of FX are very nice to have. Collectively all the tools offered in NXT are well done. Sequencing is easy. Sound design, sampling, arranging, mixing etc, it’s all incredible. I could go on and on in detail about the vast amount of pieces that make up NXT, but this would become unreadably long. That said, I encourage you to visit the developer website for all the details to fill in the blanks. Clearly I like this app. It is however not perfect. It won’t be a hit with everybody. Much of whether or not one may like or dislike NXT has to do with individual workflow and preferences. Its a sequencer not a DAW. While it is intended for use in live performances, there are still a few minor issues that might make that scenario a bit unattractive at the moment. Little things that wouldn’t be too bothersome in the “studio” (where ever that may be) may be very problematic live. One example is when previewing a sample, I’ve had it fail to stop playing. That can really get in the way. A “UNDO” option would be nice. Despite the recent update I’ve still heard some audio drop outs when leaving the clip editor. Not as much as before though. The GUI has on rare occasions paused briefly during the switch from one thing to another. Such as from the main front screen to the mixer etc. On the other hand, there has been little to complain about in general. Updates have been steady and coming with bug fixes, various improvements, and new features. As is, this is still my favorite sequencer workstation and I think it’s the best new sequencer of 2013. As time goes on it will only get better. Where iOS workflow is concerned NXT is well rounded, but not yet complete without current support for Inter-App Audio. It does have integrated AudioCopy/Paste, Audiobus, and MIDI. 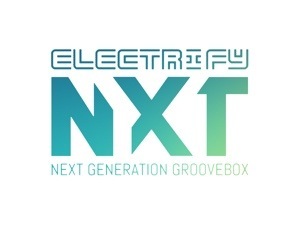 Electrify NXT is one ambitious groove box with a lot of power. Like many of you I have and enjoy Sugar Bytes other iOS apps. Turnado, WOW Filterbox, and Thysis each having some great things to offer. Effectrix is uniquely it’s own breed. While it does contain similar effects found in their other apps (minus Thysis) it is not just another effects app. The 14 “intelligent” effects are thrown onto a sequencer matrix for some unusual and sometimes perfectly chaotic looping sessions. Fun is an understatement. 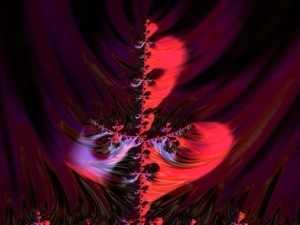 Sugar Bytes does have a way with creating interesting and useful apps that promote creativity. They also have a unique talent for making their programs ridiculously fun. Effectrix is something to get blissfully lost in as you explore the infinite combinations of effects sequenced to your specific liking. It’s a perfect interface for making sequences and easily applying any combination of the 14 FX, or all. The familiar randomizer or “Dice” are present and accounted for. Plus a large collection of presets that suit most any event. From weddings to witch burnings, and everything else. There is a bit less specific or detailed FX controls such as found in Turnado, but these aren’t stripped down effects at all. The most important parameters are there for your tweaking needs. 2 assignable modulation parts per effect allow quick and easy automation of the selected options. Full expressive control is standard. 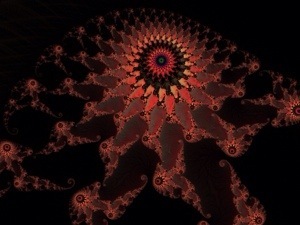 Apply the effects on the matrix by touch, and or drag along its open bar through the width of it. 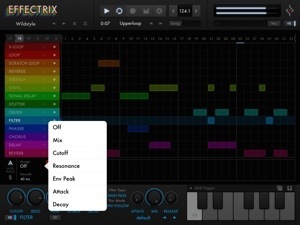 Effectrix fits any iOS workflow with support for Virtual MIDI, Network, Clock Sync etc. 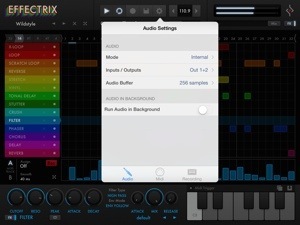 Inter-App Audio, Audiobus, and AudioCopy/Paste all here. Want to have some fun with music from your iTunes playlist? No problem, a integrated audio player and recorder come with Effectrix too. 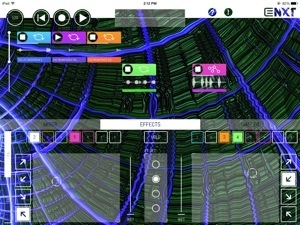 This app brings a new form of effects sequencing to the table and should not be missed. There isn’t a whole lot one can say about this. It’s just damn good.